Figure PM6.1. 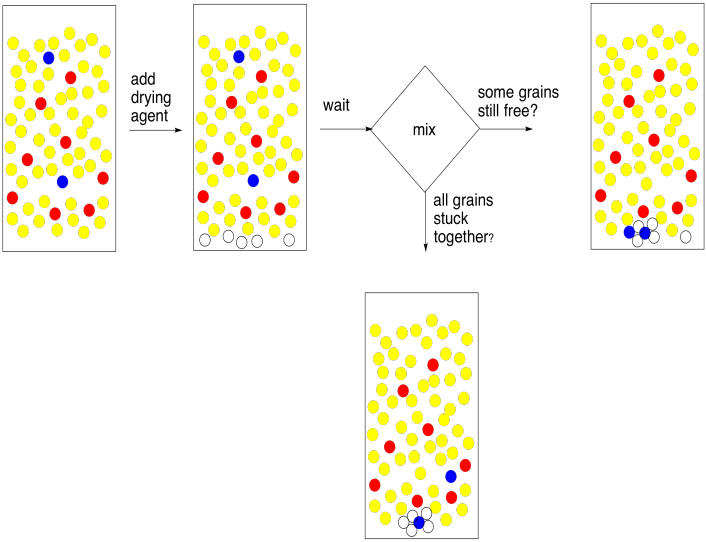 A cartoon showing the basic idea of solvent partitioning. Figure PM6.2. The next step in solvent partitioning. Figure PM6.3. The end result of solvent partitioning. Now let's take another look at the whole process and fill in some details. A solvent partitioning almost always involves the use of water and an organic solvent (based on carbon & hydrogen). In most cases, the organic solvent is not polar enough to dissolve in water. The few exceptions are instructive to look at. Methanol, ethanol, and 2-propanol -- that is, CH3OH, CH3CH2OH, and (CH3)2CHOH -- dissolve very well in water. Butanol does not, and neither does common ether -- CH3CH2CH2CH2OH and CH3CH2OCH2CH3. That comparison gives rise to a very rough rule of thumb about water solubility. That is, the carbon : oxygen ratio should be below 4:1 in order for an organic compound to dissolve in water. There are exceptions, but this is a good rule to keep in mind. If the two solvents do not dissolve in each other, then when they are mixed together, they will form two different layers. That's exactly what we want. If we have a mixture of polar and nonpolar compounds, and we mix them together with water and, say, diethyl ether, then the polar compounds should migrate to the water layer and the nonpolar compound should migrate to the ether layer. Figure PM6.4. 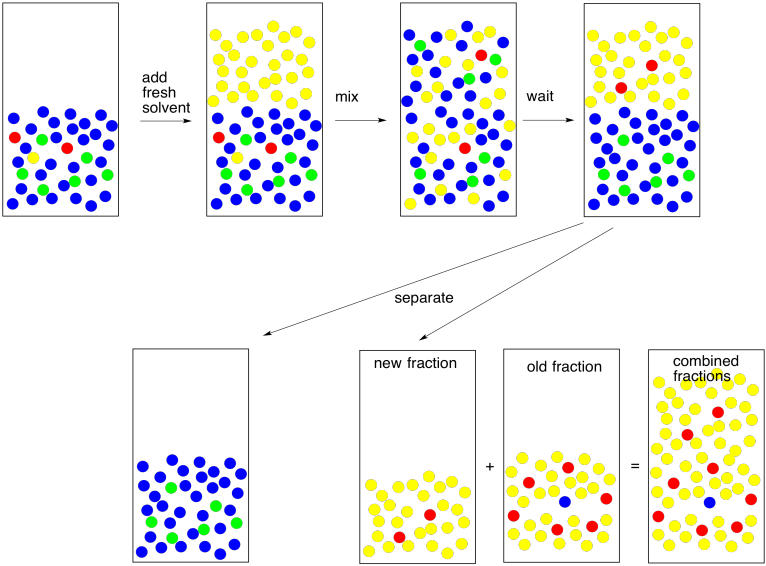 The basic idea of solvent partitioning. There are a couple of different ways to carry out this step. If we are working with a very small amount of material (such as a couple of hundred milligrams) and need only a small amount of solvents (maybe a couple of millilitres), we might do all of this in a test tube. We would use a pipet to mix the two layers up by flushing one layer repeatedly through the other. On a larger scale, we would use a separatory funnel. It has an opening on each end, with a stopper at the top and a stopcock at the bottom. We just close the stopcock, pour the stuff in the top, put the stopper on, and shake it up; typically we shake it up three times, and vent it after each time. To vent, we just open it up to let the air out, because the mixture gets a little gassy. That's because when we mix two liquids together there are always heat and volume changes as a result; the mixture may get a little warmer, or it may expand a little, so it needs more room. Most people turn it upside down and open the stopcock to vent it. Usually you can hear a little hiss when you do this. After venting for the third time, we wait for the layers to separate. At this point, we can separate the two layers. We take the stopper off, open the stopcock a little, and carefully drain each layer into its own flask. Usually we transfer them into two Erlenmeyer flasks (the cone-shaped ones). It's always a good idea to label the flasks. Alternatively, if we are on a test-tube scale, we can use a pipet to transfer the organic layer into a dry test tube. Figure PM6.5. Separating the two layers. How do we know which layer is which? The fact that two layers form depends on differences in intermolecular attractions, but which layer is on the bottom depends on density. That's something you should look up in a table. However, there are some rough rules of thumb here, too. Most organic solvents are less dense than water, so they float on the top. A few organic solvents are more dense than water, so they sink to the bottom. Usually these solvents contain heavy atoms such as halogens, like chlorine. If you're looking closely at the pictures, you will notice here is something wrong with them. 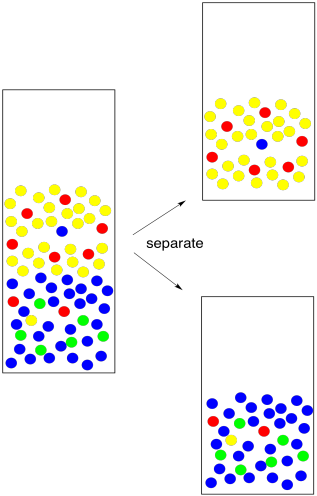 The red molecules were supposed to go into the yellow solvent and the green molecules were supposed to go into the blue solvent. In reality, it never works out perfectly. Someone always gets left behind. This isn't because of "human error", the mainstay of high school lab reports. It's because of nature. When we expect a compound to dissolve in one solvent rather than another, we are seldom rewarded with perfection. Instead, the compound is more likely to dissolve in one layer; there is an equilibrium constant that governs how much of the compound goes in one layer and how much goes in the other. Maybe 95% goes in the right layer, and the equilibrium constant forces the other 5% into the wrong one. So we go back and try again. We take the water layer and extract with fresh solvent. If we are able to extract 95% of the remaining 5%, that leaves just 0.25% behind this time. That's pretty good. By the way, that term "extract" is usually used to indicate that we are removing what we want from something we did not want. We just extracted the remaining compound from the water. Now we need to keep it safe. We combine it with the first fraction that we extracted so that all of the compound we want is in one place. Figure PM6.6. A second extraction: making sure to get every bit. Now for another practical problem. Usually when we do an extraction, we like to see a good separation between two clear layers. Sometimes that doesn't happen. Things are cloudy, they are messy, the laters are not separating well. This is not always about human error. This could be more nature. Maybe the two layers are not separating because they are not different enough from each other. One way to make the layers more different is to add brine (saltwater). That brine takes a polar water layer and makes it even more polar. Now there is a clearer choice about phase separation. Figure PM6.7. Adding brine to force better separation between layers. Incidentally, if you are worried that there is polar impurity in the organic layer, we can handle it the same way. Add brine to the organic layer to coax that polar impurity out. You will get two layers and will need to separate them again but the organic layer may be purer as a result. This step is called washing; washing is like extraction, but we are removing something we do not want rather than keeping something we do want. We are getting close to the end of a successful experiment but there is still another detail we need to deal with. Most organic solvents can dissolve a little bit of water. Usually it's an amount that is significant enough to contaminate the compound we are trying to isolate. We need to get that water out. To remove water, we add a drying agent. A drying agent is just a salt containing a Lewis acidic metal ion; anhydrous sodium sulfate, magnesium sulfate, or calcium chloride are the most common examples. These salts have been dried to remove any traces of water, but they have a natural affinity for it, and will sponge it out of solution for us. The method of using a drying agent is simple. You need to put a very thin layer of it on the bottom of the flask containing your combined extracts. Stir it up and wait five minutes. That's 5 minutes. Wait until the big hand moves to the next number. At the end of that time, swirl the flask and look at the drying agent. The thing you need to know about drying agent is that when it gets wet the grains stick together in little clumps. Some of them should be stuck together now, because your organic layer came into contact with water recently and it certainly picked up a little bit of moisture. The question is, are some of the grains free? They did not stick to anybody else? When you swirl the flask, do they fly up freely like a snow globe? If so, they must be dry. If they are dry, so is your solution. Good job! What if all of your grains of drying agent are stuck in little clumps at the bottom of the flask? They all got wet. Maybe all of the water is gone, but maybe there was too much water for the drying agent that you added. In that case, add another layer of drying agent. Wait five minutes. You get the idea. Figure PM6.8. Removing traces of moisture from an organic layer ("drying"). If you're a lab genius, you will find a shortcut to this drying business. Forget the little layer. Just add lots. That will get rid of all the water quickly. And you're right, it will. It will probably get rid of anything else you want, too. The problem is, the drying agent is a Lewis acid. It sticks to lone pairs on the oxygen atoms in the water molecules. Unless the compound you are trying to extract is a hydrocarbon, chances are it contains oxygen atoms, too; most compounds in nature do. That means it sticks to the drying agent. Too much drying agent, and you've lost all of the compound you needed. In science, this could be described as a non-ideal situation. In layman's terms, it's a complete and utter failure. Figure PM6.9. Drying agent disasters: when you add too much drying agent. There's another common problem that can appear when you add the drying agent. If the organic layer is really, really wet, and you add a drying agent, which is a salt, you make saltwater. Now you have an organic layer mixed with brine. The brine layer separates from the organic layer. This is an easy problem to solve. Just separate the two layers and go back to drying the organic layer. But wait -- is the TA looking? Maybe you can just add a bunch of drying agent and absorb all of that water. If you think that sounds like a good idea, go back and read the previous paragraph. Figure PM6.10. Drying agent disasters: when you form a briny layer. If all goes well, and you have a nice, clear organic layer, you can just filter out the drying agent and evaporate the solvent. Finished. Figure PM6.11. The end result of solvent partitioning. List reasons why ether and water SHOULD and SHOULD NOT dissolve in each other. In this case, what factors prevail in determining whether these two compounds are miscible? Ether and water have different densities. Water has a density of 1.000 g/mL and specific gravity of 1.000. Specific gravity is the ratio of a compound's density to that of water. It is no surprise that water has a specific gravity of 1.000. If ether has a specific gravity of 0.977, which compound is heavier? Which compound will float to the top and which will sink to the bottom? a) Methanol has a specific gravity of 0.980. When methanol and water are mixed, which compound should float to the top? a) Draw three compounds that you think will dissolve better in water than in ether. Explain your answer. State whether the following organc solvents would be form the top or bottom layer when mixed with water (d = 1.0 g/mL). In general, most neutral, organic compounds will dissolve better in ether than in water. Most ionic compounds dissolve better in water than in ether. Benzoic acid dissolves better in ether than in water, but sodium benzoate dissolves better in water than in ether. Why do you think this is true? Describe a series of steps you could take in the lab to separate sodium benzoate from benzoic acid via solvent partitioning. By the end, you should have a sample of pure benzoic acid in one labeled vial and a sample of sodium benzoate in another. There are exceptions to the rule that most neutral, organic compounds dissolve better in ether than water. Acetic acid dissolves well in water. Why? Some organic compounds will dissolve in ether under some circumstances and water in others. For example, suppose THF is mixed with equal volumes of ether and water, and the water layer gets bigger. b) If salt is added, the water layer gets smaller and the ether layer gets bigger. In what layer is the THF now? It is useful to remember that solvent partitioning always involves an equilibrium between two solvents; compounds often do not dissolve entirely in one solvent or the other. Suppose perfluorobutanoic acid, a member of a class of compounds used for stain-resistant carpeting, is taken up in a mixture of equal parts water and ether. Imagine half the perfluorobutanoic acid (C3F9CO2H) dissolves in the water and half in the ether (this is just a made-up number for argument's sake). What would you have to do in order to get all the perfluorobutanoic acid out of the water? Suppose you have a mixture of benzoic acid and sodium benzoate. You add 2 mL of ether and 2 mL of water to the mixture and it all dissolves. You forget what to do next, so you go to read Zubrick's Organic Chem Lab Survival Manual for a while. When you come back, you notice the top layer of liquid is only half as big as the bottom layer. There are also white floaties in between the two layers.